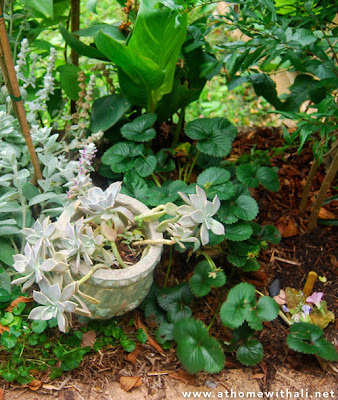 Welcome to part 2 of the Small Garden Spaces Series. If you are new to this series you can take a look here to see what it is all about. 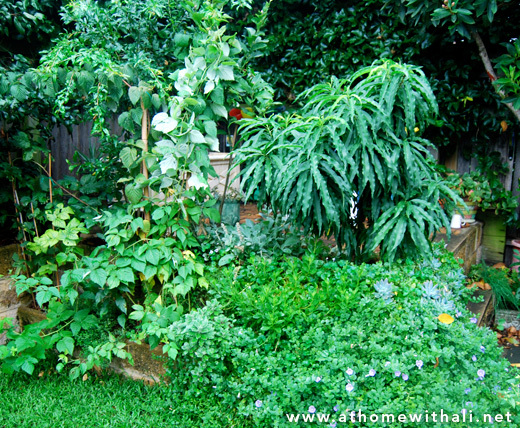 Today I am featuring our constantly-changing veggie patch. When Chris was a kid his family grew a lot of their own fruit and vegetables and it is something he really wanted to share with our kids. In our small garden space we are never going to be able to sustain ourselves with fruit and veggies but we like to grow something edible all year round. This way our kids realise that fruit and vegetables don't just come from the supermarket! We are lucky to have a small terraced section in our garden perfect for growing fruit and veg. Growing edibles in pots is also effective in a small space – try something easy like lettuce and cherry tomatoes (and make sure you use mulch and don't let the pots dry out completely). It is fun for all the family to watch something grow, ripen and to be able to pull it off the plant and eat it straight away. We don't use any chemical pesticides so we don't need to worry when the kids eat the fruit directly off the plant. We have all learned the hard way to check the fruit thoroughly for caterpillars BEFORE biting into it. We change what we grow to suit the season and our various whims. 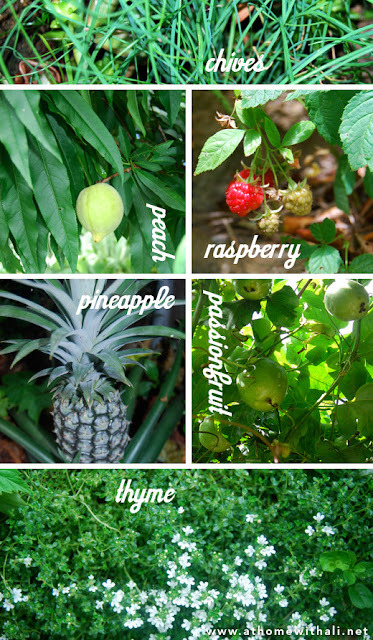 At the moment we have a pineapple plant, passionfruit vine, raspberries, a dwarf peach tree, jalapeno peppers, rosemary, chives and thyme. We are happy to give anything a go even if it is likely to fail. I really wanted to grow carrots, Chris told me they were notoriously difficult but we did it anyway. We grew the tiniest, little deformed carrots you have ever seen – they wouldn't keep one rabbit happy! There is a whole heap of gardening inspiration on the collaborative gardening pinterest board set up by Red Ted Art. Tomorrow I am featuring our mud garden – a place to get seriously dirty! I love this series - growing food is such a great way to get kids finding out where their food comes from as well as helping picky eaters to be a little less picky. Thank you for also sharing our series. No problem at all Cerys. Ahhh picky eaters – Cakey will eat mint straight off the plant but if I try to put it in cooking she won't touch it!! Thanks, the pineapple was an unexpected success. That's fantastic, it's great when the kids find little trinkets hidden in the pots. I have included a lot of links to heaps of amazing mud gardens in the next post - there will definitely be something there to inspire you. Ahhh biology would be so useful in the garden - Cakey asked me the other day how many legs does a ladybug have - errr 6, no 8 ummmmm I don't know. Ali, this is another terrific post! We are lucky to have a fairly large veggie garden of 5 raised beds where we grow lots of different stuff. My son loves eating straight from the garden. He will even eat lettuce, sorrel, most herbs and even garlic chives as long as he picks them himself. 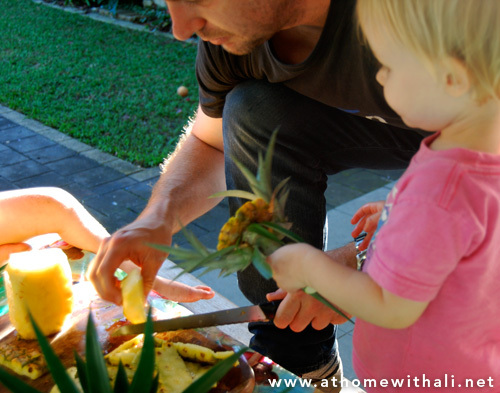 Do you mind sharing how you grew a pineapple? We tried growing indoors once, but it didn't seem to work. Thanks Yelena, my girls like to pick things and eat them straight away too. Now the pineapple - we were given a pineapple plant with a small pineapple fruit on it. We didn't think it would go very well as we are a little bit too south generally for pineapples. The weather has been warm and wet and it worked! We cut it off only last week. Apparently you can then put the cut-off stalk back in the ground and it will grow again.... time will tell with ours. I hope this helps. Thanks I am glad you like it. We seems to do well with the growing and less well with the bugs. We has a bumper crop of cherry tomatoes last year and the caterpillars had a field day! !